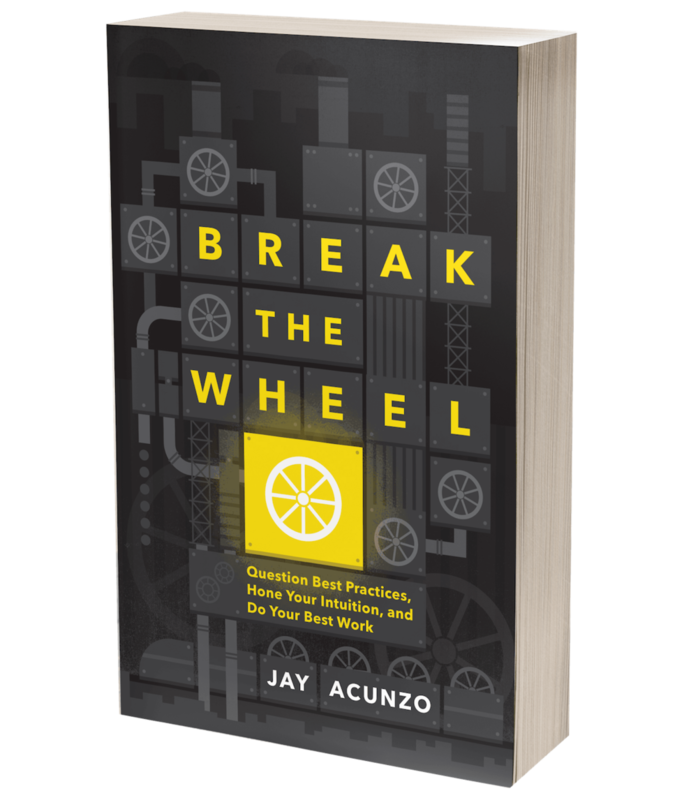 What "Sorry for Marketing" Is All About — Jay Acunzo | Author. Speaker. Maker of Shows About Work. 1. Who the hell are you, and why are you emailing me? 2. Looks cool. Like the name. But what's it all about? 3. Seriously, how did you get my email? This blog is my agonizing, last-ditch attempt to convince myself and you that quality writing and genuine creativity matter for content marketers and online media. Look, you seem nice, so I might as well be honest -- I'm pretty burnt out on all the high volume, low quality, spend-as-little-effort-as-it-takes-to-hit-publish-and-rank-on-search-and-get-some-shares-and-drive-some-pageviews-and-leads approach to online publishing and content marketing. And I think we can all do better. I think there are genuinely talented people out there who are not just prolific writers, but creative, quality writers capable of telling really great stories. I also think that, as history has proven, any marketing tactic that rises to popularity will be met with tons of people who want to game that system. The problem with that knee-jerk reaction is that today's "system" to be gamed is the creation of content that people really like and choose to spend time with. This isn't about display ad buying or email optimization or keyword stuffing and link building to rank on search. All of that surrounds or distributes or points to one thing: The content you created. The content that, ideally, was created to build you an audience that you own, that loves you and shares your message, and that converts. To do that, it's much harder to try and make a dud of a missile fly than it is to create something that's honestly good. But does that stop (some) marketers from trying to cut every corner possible? Absolutely not. Through sheer force of effort and short-term focus, they can get some life out of a dead piece. But much better for real results (like customer-gen, not just lead-gen...or retaining an audience, not just churning through impressions) would be to deploy the hard stuff: a care for quality and a genuine creative ability. I've produced or consumed enough list-based blog posts to open a Tips N Tricks R Us mega-store. I've written or edited mountains of ebooks and guides that sound really great, but lack any sort of care for the paragraphs inside them. "There just isn't time, and we have numbers to hit," someone external or internal seemed to say each time. I've taken all the "What Thing Are You?" quizzes. Each one of mine came back, "You're pretty sure this isn't the most creative people can be." I've clicked on (or even written) too many headlines that promised me something "Unbelievable" or "Ultimate," only to discover the actual content was rather believable and 'timate. This is about resonating with people, not just "reaching" them. Ironically, the first can lead to the second. Caring about resonance and quality and caring about your company's reach and results are not mutually-exclusive endeavors. Getting results becomes much easier if you first focus on the audience and on respecting and helping them, rather than on the tech, the tactic, or the metric, which too often becomes the object of marketers' obsession and causes us to just try and game the system. And, honestly, I'm not here to write about or curate or advocate for NOT getting results as a business. In my day jobs, I've helped build a couple businesses through content (Dailybreak Media, HubSpot) and now advocate that startups in Boston and NYC do the same (through my work with NextView Ventures). I would, however, like to write about and advocate for creating quality stuff. I'd like us to stop polluting the web with minimal viable junk and start caring more about the creativity and integrity of our work. Said in marketerese: Conversions happen after the click, whether you judge those conversions with marketing funnel metrics or positive emotional reactions. (That's also the key difference between publishers like Upworthy or Huffington Post and you and me in content marketing -- we have to be good enough to gain an action, not just a pageview). Is there some idealism here? Probably. But I like to think of it as long-term thinking balancing out the short-term. Unfortunately, I think the latter gets the bulk of a company's focus 11 out of 10 times in some cases. And it boggles my mind that we may be at a point where someone (in this case, me -- in future cases, I hope you) openly calling for quality and creativity in one's work can be at all interpreted as weird or contrarian or not aligned with business objectives...especially when you consider that this work is the act of creating things for other people. Look, I like working in marketing and business. I really do. I just think everybody takes themselves too seriously sometimes and gets caught up in the wrong things. There are "strategies" (picture a guy in a suit furrowing his brow and tapping the table with his fist) and "thought leadership" (furrowed brow, table-tap) to uphold and perpetuate. Why care for all this ephemeral, fluffy, "quality" and "creativity" stuff? Let's just game the system to get short-term results, even if that system to be gamed has ceased to be forceful advertising and is now the more subtle art and science of creativity. The problem is, to state it again, conversions happen AFTER the click, when people actually have to spend time with your content. So, I'm writing Sorry for Marketing to locate, learn about, and celebrate the good stuff, poke at the crappy stuff, and generally have some fun making the case for why quality matters more than ever. And I know some people will roll their eyes and others will argue passionately for things that run counter to all of this. That's okay - this site isn't for them. But if you believe fiercely in quality and creativity in online content, then this site is for you. Say hi on Twitter or subscribe on the home page in the top left. Posted on April 27, 2014 by Jay Acunzo and filed under creativity, content marketing.